Whether you’re working your way up into a role specifically titled ‘project manager’ or just help with some aspects of management in your organization, project management opportunities can be found in essentially every field. These skills are often transferable between organizations, and can lead to some of the largest jumps in earnings across your lifetime of almost any skill set. Furthermore, even seasoned project managers have areas of expertise they can enhance. Those areas may be soft skills, new project management methodologies, a subset of project management, project management tools, or industry-specific bases of knowledge. With this in mind, a huge swath of professionals and knowledge workers stand to benefit from project management learning. In an effort to bandy some of our experience curating project management education into an accessible list of resources applicable to a wide group of learners, we’ve compiled the following 50 resources for learning project management. As with most professional certification programs, the Project Management Institute requires that professionals with their certifications obtain a specific number of Professional Development Units (PDU’s) to upkeep their certification. While the Project Management Institute is perhaps the largest certifying body for project managers, a number of other certifying bodies also require continuing education credits. Luckily there are a wide variety of ways to obtain PDU’s including attending webinars, writing content, online courses, or even reading articles about project management. Check out some of the best places to upkeep your project management certification skills below. For those looking for a greater level of instruction, many academic institutions offer online courses or certificate programs in project management. Check out the directory of PMI accredited schools to find a program that fits your needs. 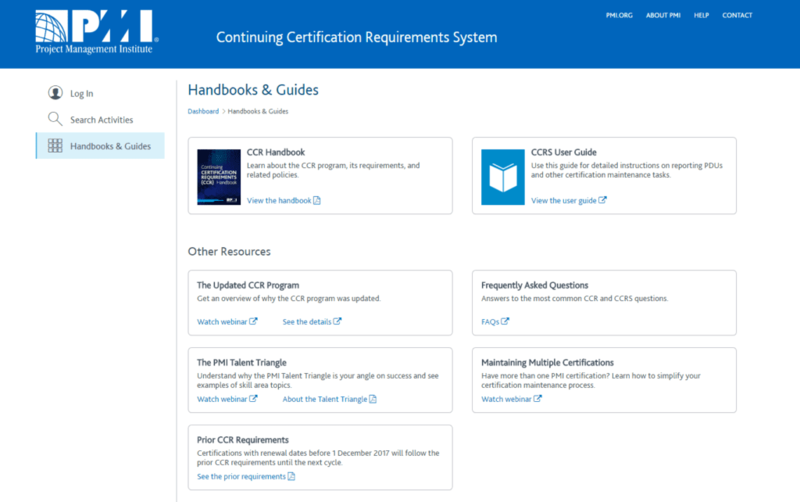 If you want to discover exactly what can count as a PDU, check out the PMI’s handbook on continuing certification requirements. Like podcasts? The PM Podcast offers over 60 PDU’s just for listening. Interested in being heard or doing a little research? Sign up to create content for ProjectManagement.com. Content created in line with the PMI re-certification guidelines can count for PDU’s. The IT Metrics and Productivity Institute provides a wide range of webinars throughout the year that can be used for PDUs or CDUs. Already checked out the PM Podcast? IAG’s blog provides both webinars and podcasts that can be used to obtain PDU’s. Yet another location for PDU’s through webinars and podcasts is the Corporate Education Group. Rotating through different webinar and podcast sources can provide years of PDU’s that conveniently fit into your schedule. Looking for affordable courses? PMCampus.com provides a number of training bundles that can be used to obtain PDU’s. Finally, wondering how to log PDU’s that you have completed? Login in through the PMI Continuing Certification Requirements System to get credit for your upkeep work. Certifications are one of the best ways to show a wide range of employers and clients your expertise in project management. There are also more locations than ever through which you can study for certifications online. Below we’ve chosen some of the most popular project management certifications to provide online learning resources for. Not sure which certification to prepare for? Check out our guide to project management certifications for more information. One of the best (and most authoratitive) resources for PMP prep is the PMI itself. Check out practice tests, outlines of what will be tested, and the PMP handbook. Project Management Academy offers a four-day bootcamp for the PMP certification. The bootcamp may be attended online or in-person. Simplilearn’s PMP Training comes in three options, a self-paced version, a 90-day instructor-led version, and corporate classes. Depending on your learning style, Simplilearn’s likely has your PMP training needs covered. 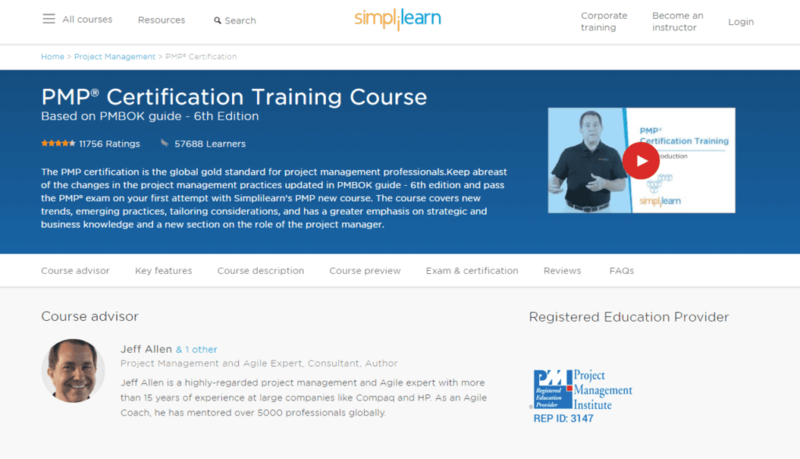 The most popular Udemy course on PMP also provides PDU’s for once you’ve passed your exam. Make sure to wait for regular Udemy sales to snag a copy. Cybrary offers a free online PMP prep course that also provides CEU’s. Ucertify is a platform used by many businesses and universities for certification prep. A ton of learning tools are packed into their offerings including note cards, forums, videos, and text. Whizlabs provides a number of tools for preparing for your PMP exam including an exam simulator, free practice tests, and training materials. ONLC Training Centers provide a training and exam voucher bundle that also comes with training software. Tackle your Project+ from multiple angles with this package. The best selling Project+ Course on Udemy has almost 3,000 students enrolled. Utilize a variety of learning tools including forums, videos, quizzes, and more. Cybrary is a leading source for prep materials for most CompTIA certifications. Their courses on Project+ preparation subscription comes with access to a mentor, diagnostics, and learning materials. A number of online learning tools are available through Whizlabs including a practice test and exam simulator for your Scrum certification. SimpliLearn offers perhaps the most comprehensive package for Scrum Master prep. Their package includes PDUs, an exam voucher, two years of membership to the Scrum Alliance, and membership to a course that includes training aids, games, slides, videos, and so forth. AgileTraining.Co provides a comprehensive package including access to a trainer, online training materials, a test voucher, and a number of PDU’s. The most popular scrum course on Udemy has over 50,000 students. Utilize Udemy’s learning tools to ace your Scrum exam with this resource. Simplilearn’s Lean/Sigma Six Bundle is on the pricier side, but includes 10 simulation exams, 4 industry-specific projects, and a number of online learning materials. Looking for something a bit quicker? Cybrary provides a short 3-hour Six Sigma refresher course that also provides PDU’s. Whizlab’s PRINCE2 prep is accessible on a wide range of devices and supported by the course author (he’s there to answer questions you may have). Make sure to try out Whizlab’s occasional sales to save on your training bundle. SimpliLearn’s PRINCE2 prep comes in three varieties: self paced, instructor led, and corporate instruction. Each comes at a different price point, but all three provide many learning tools for mastering your PRINCE2 exam. For the CAPM exam, make sure to first check out PMI’s exam prep guide. This is the first place where updated information on the exam will appear, and a great starting place for your course of study. For learners who learn best in cohorts and intensive sesssions, EduMind’s CAPM prep may be the right choice. This exam occurs over four days around a weekend of your choice. Whizlab’s CAPM prep offers a variety of tools at different price points including practice exams, an exam simulator, and self-study materials. Cybrary’s CAPM prep resources are wide ranging and include virtual labs, practice tests, capture-the-flags, access to an instrutor, and more. For the ACP exam, make sure to check out PMI’s exam prep guide first. This will be the first location new and updated information on the exam (as well as study materials) will be posted. CPrime offers a number of subscription-based training services that include webinars and courses. Over 11,000 students are currently enrolled in SimpliLearn’s ACP prep, making it one of the most popular options online. Three options are available: self-paced, instructor-led, and corporate training. Master of Project has perhaps the most comprehensive PMI-ACP training online, with over 100 lectures, practice tests, cheat sheets and more. Some managers aren’t after a particular certification, but are rather seeking better results through enhancing their knowledge. Perhaps you’ve never managed a project and want to see if it’s for you. Or perhaps you have a project of your own you want to optimize. Whatever the reason, there are tons of resources online for learning project management skills. Check out a few of the better online options below. If you’re looking to enhance general knowledge of project management, or delve deeper into one component, Coursera likely has you covered. 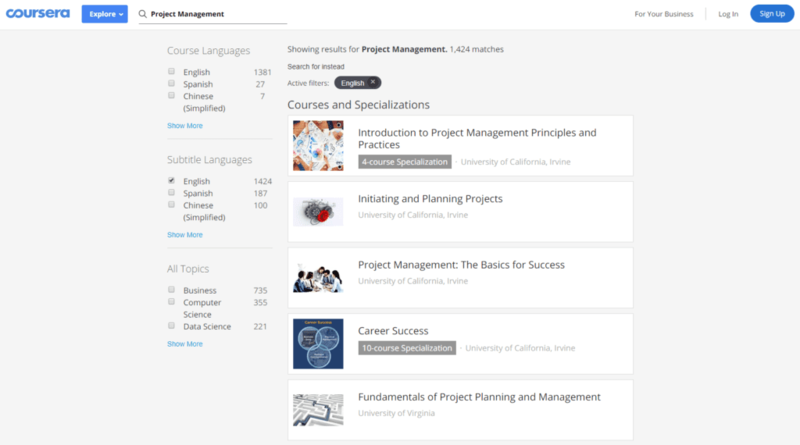 Over 1,000 project management-related courses are available on Coursera. An often overlooked skill set in project manager training are soft skills. Check out team technology’s soft skills training for more detail. For students looking for an introduction to project management as well as something to put on their resume, Alison’s Diploma in project management may be a good choice. The Project Management Institute has a directory of project management courses it recommends in a wide variety of languages, a wide range of skill levels, and a wide range of price points. For a more ongoing method of enhancing project management knowledge, check out some of the best blogs on project management. Additionally, check out classic project management books for a more in-depth dive. Many project management skills or applications are industry specific. Check out industry-specific project management learning resources below. Additionally, many online degree programs offer specializations in different industries. Construction Project Management is a course presented by Columbia University and Coursera. Besides introducing industry-specific concepts, it introduces students to industry leaders in project management. The Associated General Contractors organization provides a variety of online education opportunities centered around construction projects. 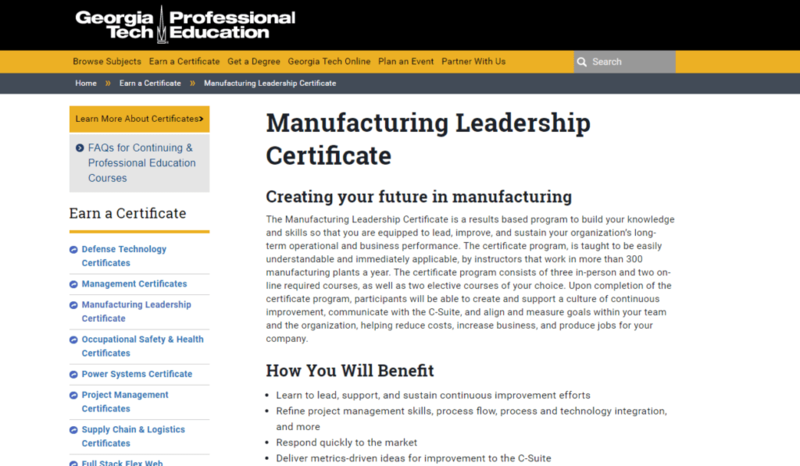 Georgia Tech offers a fully online for-credit certificate in manufacturing leadership for those looking to gain an academic perspective on PM roles in manufacturing. A variety of courses in project finance are available on Coursera. Courses are available in a number of languages and some lead to certificates of completion for paying students. University of Georgia offers a fully online module in Project Management for Health Care Settings. The course also provides continuing education credits. New York University offers a self-paced online course in project management for health care settings. This course also provides PDU’s for a variety of certificate types. The University of Washington offers a three course bundle in project management for information technology. Presented on EdX, a number of learning tools and support features are available. The Global Institute for Project Management presents an online course that utilizes case studies, experential learning, and pedagogy suitable for adult learners to introduce entrepreneurs to project management. Close to 7,000 students have taken the top Udemy course on project management and entrepreneurship. 4.5 hours of video, quizzes, exercises, and additional information is provided with this course. The highest rates course on Udemy for entrepreneurship and project management helps step beggining entrepreneurs work through their business plans using project management methodologies. An entire cottage industry has sprung up just surrounding teaching teams to use project management software. While most PM’s should have no trouble getting the basics of project management tools and software, it never hurts to advance to power user status. Below we’ve highlighted some of the best PM software skill enhancing resources for the most popular project management softwares. Microsoft Project is the most popular project management software, and this is Udemy’s most popular course for learning MS Project. Join over 3,000 students in learning best practices and advancing to MS Project power user. For learning how to use Wrike, one of the best resources is through the makers of the software itself. 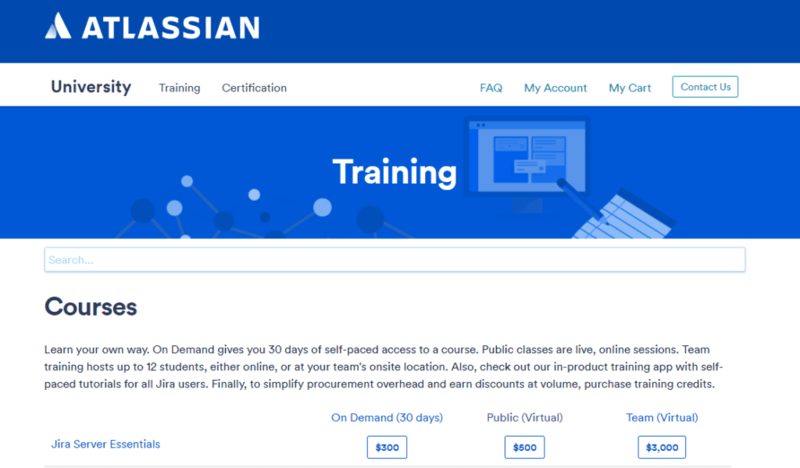 Atlassian provides high quality courses on a number of their products. Courses may be ordered on-demand, through live on-demand ocurses, or for entire teams. Basecamp provides two types of classes both of which offer opportunities to ask questions of experts regarding Basecamp software. FutureSimple provides courses on Podio, as well as Base for individuals and teams. The Asana Academy has over 20 courses for very user levels of the popular project management tool Asana. Trello Project Management is the most popular Udemy course on using Trello in project management settings. Over 1,000 students have taken the course. Smartsheet offers individual (live), self-paced, and team training for their product, Smartsheet. What is a Master’s in Project Management Degree?What is a Project Management MBA?